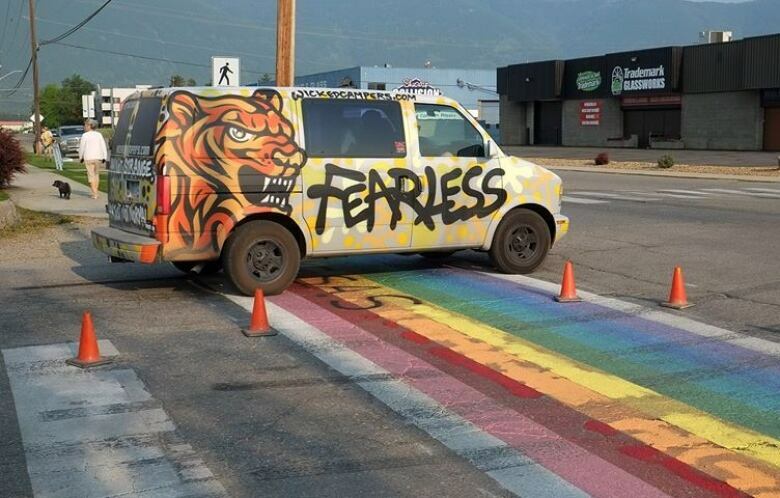 The mayor of Salmon Arm says the city is determined to keep repainting its new rainbow crosswalk after it was defaced twice in the fortnight since its installation. The graffiti found on the rainbow crosswalk on Monday does not reflect the wider Salmon Arm community, Mayor Nancy Cooper told Chris Walker the host of CBC's Daybreak South. "We're committed to carrying on and repainting again if we have to. We're an accepting community and we want to be inclusive to everyone." 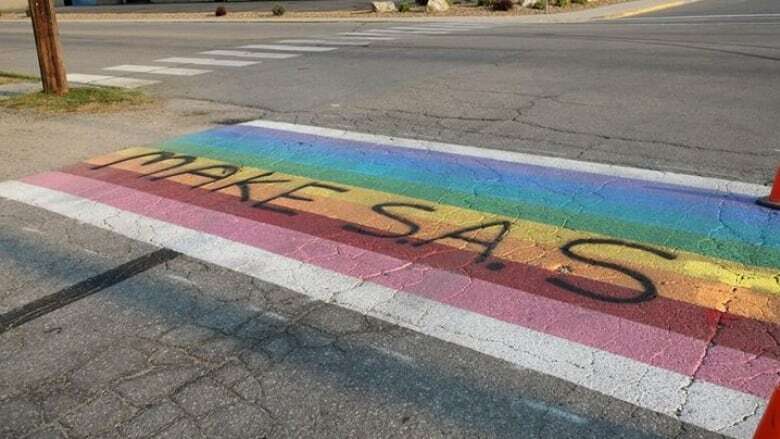 On Monday, the words 'Make S.A. straight again,' were found painted onto the crosswalk, along with tire burn marks. This incident follows a similar defacement on July 25 when tires marks were also burned onto the crosswalk. Mayor Cooper said the city had been warned to expect vandalism after rainbow crosswalks were defaced in other parts of the province. The Salmon Arm RCMP are treating this latest defacement as a hate crime said Sgt. Scott Lachappelle. He said that vandalism, itself, is a crime, but the RCMP believe the crosswalk graffiti targets a particular group of people, qualifying the act as a hate crime. Salmon Arm gave the green light for the rainbow crosswalk in January, and Cooper said the idea stemmed from a consultation meeting the city held with local high school students. The students were concerned at the lack of Pride events and specifically requested a rainbow crosswalk from the city. The crosswalk was installed in July, and Cooper said the local high school students have plans to hold an official opening ceremony soon. "These are the future leaders, and, in some things, the students are actually ahead of us, so council took them seriously and let's honour what our young people here in Salmon Arm would like to see."